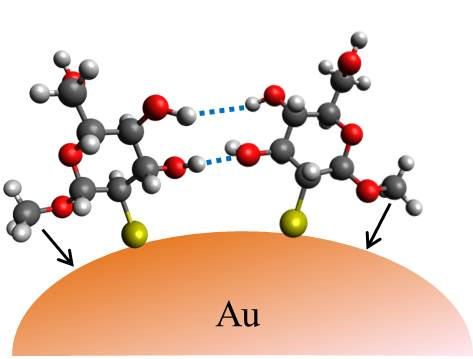 Carbohydrates carrying thiol groups at the C-2 position have been attached to gold nanoparticles (AuNP) with stereocenters in close proximity to the surface for the first time. Their configurations can be clearly distinguished by the tendency of particle aggregation. AuNP surface plasmon resonance (SPR), x-ray photoelectron spectroscopy (XPS), and IR spectroscopy indicate that the thiocarbohydrates replace citrate molecules at different rates, causing aggregation and eventually precipitation. A quantitative formulation of this aggregation process shows that reactivities can vary by several magnitudes. Adsorption isotherms and kinetics also demonstrate that the number of thiocarbohydrates varies by a factor of two. Molecular mechanics force field (MMFF) calculations reveal their relative orientations. Based on these models, the different binding behavior can be ascribed to attractive van der Waals forces and hydrogen bonds. Such interactions occur either between the carbohydrate and AuNPs, by lateral intermolecular forces at the surface, or by interparticle attraction, in analogy to cell-surface carbohydrates of biological recognition systems. Aggregation of NPs therefore act as an indicator to differentiate between various carbohydrates with defined configurations.